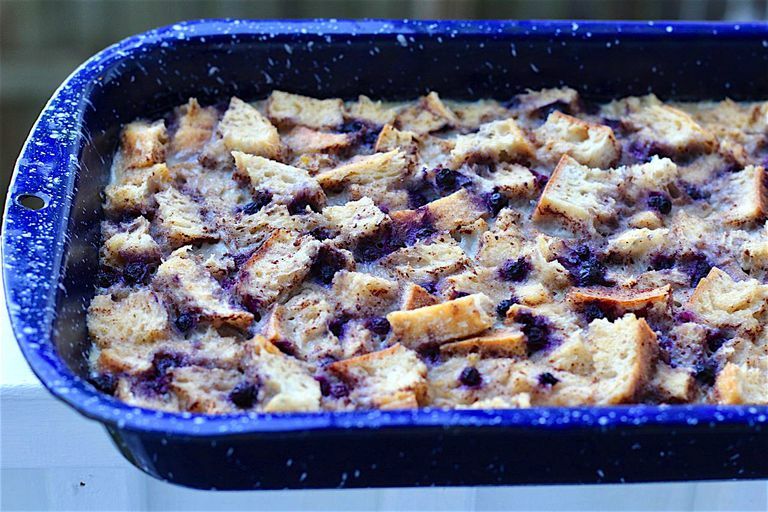 Bread pudding is easy to make and an economical way to use up stale sourdough bread. This version has plenty of creamy custard, studded with colorful low-FODMAP blueberries. Their sweet-tart flavor, accented with lemon zest, blends beautifully with the warmth of cinnamon and nutmeg. Grease a 7 x 10-inch baking dish heavily with the butter. Distribute 2 cups of bread in the pan. Sprinkle in blueberries, and top with the remaining bread. In a large bowl or blender, thoroughly whisk together the eggs, milk, brown sugar, cinnamon, nutmeg, and lemon zest. Pour the egg mixture over the cubed bread. Bring a kettle of water to a boil and preheat the oven to 300F. Allow the bread to soak up the milk mixture while the oven preheats. Press down gently with a fork to make sure that all parts of the bread cubes are well-soaked. Place a roasting pan on the middle rack of the oven and pour in an inch of boiling water. Set the smaller baking dish in the water bath. Carefully pour a little more boiling water into the larger pan to bring the water bath to within ½ an inch of the top, and bake the bread pudding until the internal temperature reaches 165F, about 50 minutes. Custard should not slosh in the middle when you gently move the pan, but it will still be soft. Remove from the water bath, cool for 40 minutes, and serve warm. Sourdough is the best bread choice for this recipe. Although a bread, traditional sourdough is considered to be low-FODMAP because of the fermentation process it undergoes. The process is longer than that of traditional bread, allowing the yeast and bacteria to remove many of the higher FODMAP aspects. When buying, do your best to learn the technique used to make the bread. If it's a traditional technique or the bread is made from oat or spelt flour, then you should be able to enjoy it without triggering symptoms. The recipe calls for placing the baking dish inside a larger pan of boiling water. This is called a water bath, and it keeps the eggs in the custard from separating and becoming watery. If you don't have a pan big enough to provide a water bath for your baking dish, you can place the dish directly on the middle rack in the oven. Cooking time may be reduced, and a sweet watery layer may form at the bottom of the pan when you cut into the pudding. It will still taste delicious! This bread pudding can be warmed up at 250F for 15 minutes to be served at a later time. Craving a Cheesecake Without Tons of Sugar?